Cancer occurring in the kidneys is called nephroblastoma. It was discovered by the German doctor called Max Wilms. To understand the way the tumour affects our body, we need to know a bit about the kidneys. Where are the kidneys located and what do they do? The kidneys are two bean-shaped organs present in the abdomen, towards the backside. The lower ribs protect the kidneys. There are two small glands resting on top of the kidneys called the adrenal glands. These are responsible for our “fight or flight” response through adrenaline. So, what do the kidneys do? The blood from our body enters the kidney tubules, called nephrons, and get purified by the difference in concentrations, difference in fluid pressure and the membranes present. It also regulates the amount of water and salt in the urine depending on the amount of water present in the body. Apart from filtering and removing excretory products, they also produce certain hormones like renin and erythropoietin. Statistics say that 9 out of 10 kidney cancers are Wilms’ tumours. They are usually unilateral, which means, they affect only one kidney. they often present as single tumours. Only 5-10%of the cases are multiple tumours. they are usually detected before they metastasize to other regions. 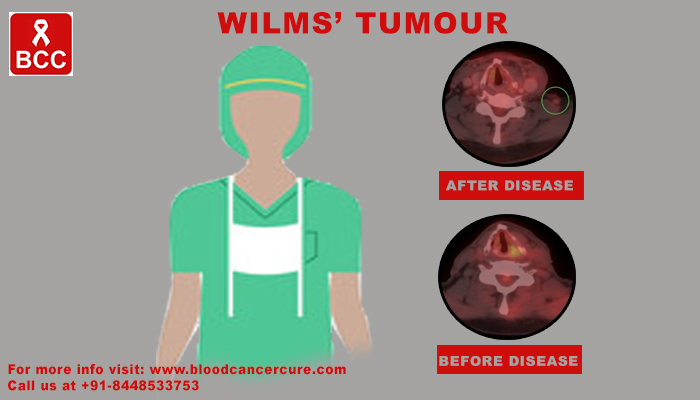 What are the types of Wilms’ tumour? There are two types of tumours. This is based on the prognosis for each tumour. FAVOURABLE HISTOLOGY: this is a type of containing in which the cells do not change too much. They are cancer cells but one cell does not vary from the other by too much. They are easier to cure and have a good prognosis. UNFAVOURABLE HISTOLOGY: this is a type of tumour in which the cells vary widely. The nucleus tends to be large and distorted and containing types not resemble the other cells by much. This is called anaplasia. They are much more difficult to cure and have a poorer prognosis. What are the causes and risk factors associated with Wilms’ tumour? The cause of cancer is not very clearly known. There is a genetic link that is seen. Like all cancers, there is an alteration in the genetic make-up which leads to uncontrolled multiplication of cells. They accumulate and form tumours that disrupt the normal function and also cause other problems. They have a tendency to spread to other organs. Age: this tumour is more common with the younger age group. Children are more affected when compared to the adults. Race: the African-American race tends to have a higher rate of incidence than the other races. Asian-American race is at a lower risk than the others. Family history: if the parents, or anyone in the family is said to have been affected with Wilms’ tumour, there is an increased chance of occurrence in the offspring. Syndromes: Wilms’ tumour may occur with some rare syndromes. WAGR syndrome: Wilms’ tumour, aniridia, genital and urinary abnormalities, and intellectual disabilities. Beckwith-Wiedemann syndrome: Wilms’ tumour, macrosomia (abnormally increased body size), macroglossia (large tongue), a type of liver cancer-hepatoblastoma. What are the signs and symptoms of Wilms’ tumour? How do you diagnose Wilm’s tumour? Ultrasound: using sound waves and their echoes, an image of the underlying structures are drawn up. A gel-based lubricant is applied and then the waves are passed, which is then visualised on a screen. This method is one of the simplest, and safest diagnostic aids. Computer tomography (CT scan): X rays are used to obtain cross-sectional images of the patient’s body. It gives us a picture of the dimensions, related structures, and the extent of a tumour. It plays an important role in planning the surgery. Magnetic resonance imaging (MRI scan): when the doctor requires a very detailed image of a tumour and its surrounding structures, this method is used. It is done when the doctor suspects that a tumour is impinging on a major blood vessel or nerve. Chest X-ray: this is done to see if a tumour is spread to the chest. Bone scans: this is usually done only when the doctor thinks that a tumour has spread to the bones. This is not commonly recommended. Biopsy: a tiny section or an entire tumour after excision is sent for biopsy. The cell cytology is then studied and the pathologist comes to a conclusion on the diagnosis. After the diagnosis, tumour staging is done. This helps in planning the treatment. Treatment varies based on the staging. Stage 1 with patient below the age of 24 or the tumour weighs less than 550g: surgical excision. Stage 1 with patient above the age of 24 or a tumour weighs more than 550g: nephrectomy (removal of the affected kidney) and lymph node sampling. Stage 2: this includes nephrectomy with radiotherapy. Stage 3: preoperative chemotherapy, followed by nephrectomy, lymph node sampling and radiotherapy. Stage 4: nephrectomy, lymph node sampling, abdominal radiation therapy, pulmonary radiation therapy, and chemotherapy. Stage 5: preoperative chemotherapy, nephron sparing surgery or nephrectomy, chemotherapy, and/or radiation therapy based on the staging. The 5-year survival rate for Wilms’ is around 90%.